I have been looking at what is presented till now at the various catwalks, in respect of the F/w 2018 season. More skirts for men presented again. More so than previous years? Or as many? Daryl wrote: except for that ludicrous clown outfit". That's the problem, every time skits for men shows up at a fashion show they always are presented in a clown like fashion that no one would ever consider wearing. The ludicrous clown outfit one! Not so different from the clownish stuff that shows up for women a lot of the time. Maybe it just means we are getting equal treatment. 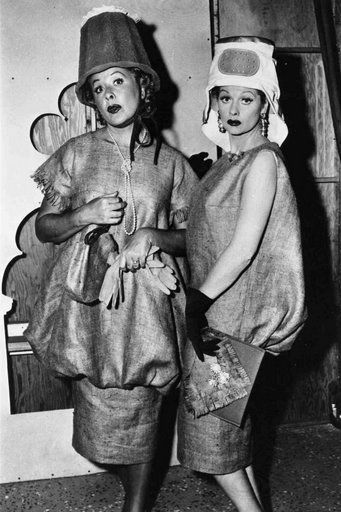 I am reminded of an episode of "I Love Lucy" when they went to Paris, and Lucy demanded that Ricky buy her a dress from one of those ridiculous fashion shows. He convinced her that the hottest new trend among Parisian elite was a burlap sack... hilarity ensues. moonshadow wrote: For those of us who wear skirts out in the public eye, that... is our runway. We choose our own styles, and we put on a public display. What we do each day probably has a better chance of changing minds than some of the ridiculous stuff you see on runway catwalks. Even my looks, eclectic as they tend to be, are still tame by comparison. There may be differences in taste between members-some members are a bit more flamboyant than others-but everybody is looking for garments that can be worn as clothing. Not pieces of art work intended to show off the genius of the fashion designers. moonshadow wrote: And then there's the children who see us. Ages toddler to preteen. Those will be the minds changed in the coming generation. Ironically, even if the parent condemns it to the child, it now places the practice in the realm of "forbidden fruit", and that notion sticks with the childs memory into adulthood. As we all know, "forbidden fruit" tends to attract people. Indeed. I've had children ask their parents in elevators why that man is wearing a skirt. Of all the answers I heard none were bad answers, and I imagine those youngins had their ideas about what is possible significantly expanded. I had that once or twice about my earrings, but much longer ago when it was still unusual for men to wear two. Mr. T and I were almost the only men they'd ever seen with two earrings at that time. Nowadays wearing just one is kind of strange. I started wearing two earrings about 1985 when I started at University and it was rare for a man then. My reasoning was that ( and bear in mind that this was before the Internot wasn't even a twinkling in anyone's eye and notworking was still a black art ruled by command line instructions and Kermit, remember him? ) one side was supposed to indicate hetero and the other homo but there didn't seem to be any consensus as to which was which. So, I though, to h*ll with it, women wear in both so I marked and pierced my own lobes. I lost confidence a time or two and in such times removed them but couldn't leave them out for long as the holes would have closed up. I wear them most days and change them every 3 or 4 days for novelty and hygiene. Sinned wrote: I started wearing two earrings about 1985 when I started at University and it was rare for a man then. My reasoning was that ( and bear in mind that this was before the Internot wasn't even a twinkling in anyone's eye and notworking was still a black art ruled by command line instructions and Kermit, remember him? ) one side was supposed to indicate hetero and the other homo but there didn't seem to be any consensus as to which was which. So, I though, to h*ll with it, women wear in both so I marked and pierced my own lobes. I lost confidence a time or two and in such times removed them but couldn't leave them out for long as the holes would have closed up. I wear them most days and change them every 3 or 4 days for novelty and hygiene. I have one pair that I nearly never remove. They are of my own construction; stainless steel with captive pins so they won't fall off too easily if snagged in my sleep or something (unlike eg. captive beads). I am not aware of them from day to day. I've always worn two, after about my first year, mostly because I didn't like feeling unbalanced. Yes, I remember Kermit. Very handy. Daryl wrote: Yes, I remember Kermit. Very handy. As do I. I was actually the very last maintainer of the Kermit port for the Intergraph CLIPPER platform before the project went fallow. Very useful stuff. Though I was a youngster when male earrings came into style, I do remember the chatter at school about which side was the "gay side". I just remember being glad I was a boy so I wouldn't be nagged about poking a hole in my ear as I didn't care for needles then (just as now). Funny, for girls, piercing ears seems like a sort of "rite of passage", and I remember it seemed as though it was expected of all girls to have their ears pierced whether they wanted to or not. Then as I progressed into my teenage years in the 90's, along came the punk goth scene and teenage boys dressed in black demonstrated to me that NOWHERE was piercing off limits! To this day, people of both sexes seems to have piercings where ever they want. Not my thing, but glad it doesn't seem to be an issue for people any longer, though male piercings do still seem to be somewhat of a taboo in employment situations. While it's allowed in most places, it can't be the big "dangly" stuff that women like to wear, and is mostly restricted to studs only. They'll say "No, you must be straight!" "I thought he might be one-a them homo's, but then I's seen'em drivin' dat-der dodge, reckon I's mistaken...."